On Christmas Day at my brother and sister-in-law's house, I spied the most beautiful dish of smoked salmon with all of the garnishes. I fell in love with the color of the red onion against the green capers and the bright color of the fish itself. I decided to take this idea and make a vegetable version using the Christmas salmon as inspiration. So, yesterday, when I was showing off our carrot "lox" plate, my dad exclaimed, "That's the most beautiful piece of salmon I've ever seen." "Yes, it is," I thought deviously, "yes, it truly is!" Now, what we did here is actually pretty simple. The thin slices of carrot get the same sort of cure one might use on a fish. It's simply a mix of salt, pepper, and brown sugar. We used smoked salt to save the extra step of smoking the dish on the smoker, and the result's great. In fact, these may the the best carrots you've ever had. So put this out at your next gathering or party. It makes a delicious conversion piece. Peel and very thinly slice the carrots longways on a mandolin. In a small bowl combine the smoked salt, brown sugar, and black pepper. Layer the carrot slices in a large bowl and add a pinch of the spice mixture to each layer until all of the carrot slices and spice mixture are used up. Set this aside for 30 minutes. The salt will soften the carrots and leach out much of their liquid. Remove the carrots from the bowl and discard the liquid and spices that have gathered at the bottom. Add the carrots, eggs, and lemon zest back to the bowl and toss to coat each strand with egg. Line a 1/4-sheet pan with parchment paper and brush it with olive oil. Preheat your oven to 350 degrees. 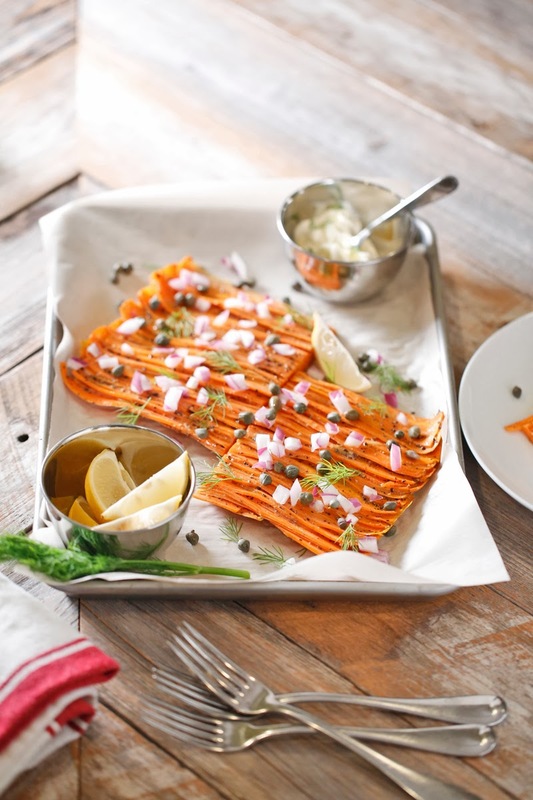 Starting with a long strand of carrot, lay it flat across the parchment paper. Continue to lay the carrots one after the other overlapping them almost completely. Pair shorter strands together to span the length of the dish. Once all the carrots are laid out, brush the top with the egg that remains in the bottom of the bowl. Cover the dish tightly with aluminum foil to seal in the moisture. 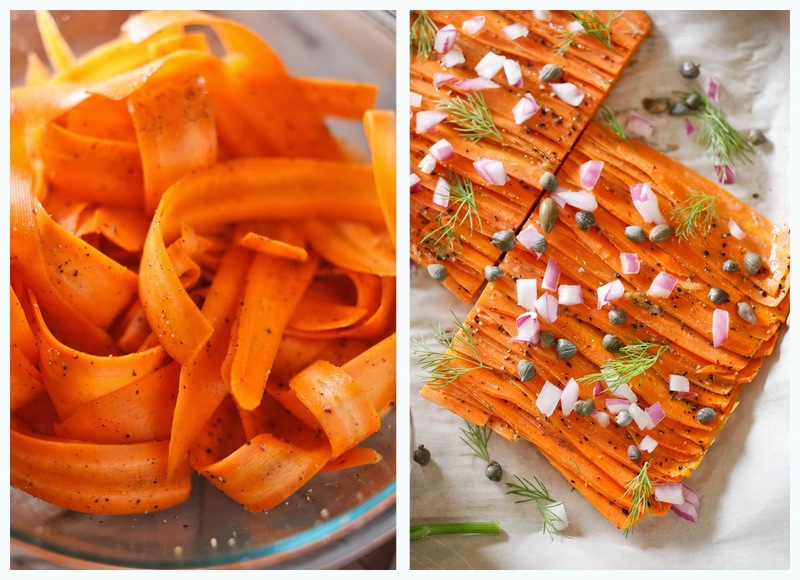 Bake for 30 to 35 minutes or until carrots are just tender. Keep covered and allow it to cool completely. 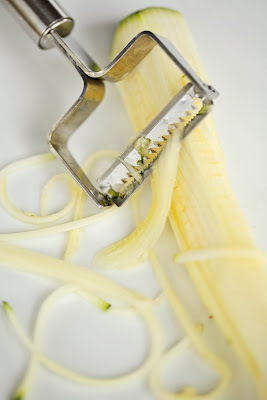 *Once you've diced the onion, place in a bowl of cold water for a few minutes and drain. This will wash away any of the astringent taste associated with raw onion. It's a good idea to do the same to the capers. We met Executive Corporate Chef Steven Lusby, Berkley Spivey, and the rest of the amazing crew of Charleston, South Carolina's 82 Queen while we were in NYC for our James Beard Foundation presentation at the beginning of December. Fate had us all cooking in the same kitchen that day. We were making 3 different snacks for 25 people, and they were making an 8-course dinner for 65 folks. Can you imagine the pressure? It didn't seem to wear on them at all. They were so gracious and amazing from the first second we met. I was checking out the menu at 82 Queen and came across this amazing-looking vegetarian dish for cauliflower steak. They were kind enough to share the recipe with us so that we can share it with you. All of the components together make up one of the best vegetarian main dishes that we've had anywhere at anytime. The takeaway here is that you have 5 sub-recipes that can be pulled out and used separately in so many ways. That, we believe, is the hallmark of a great chef: each ingredient is considered so that each component has as much flavor as possible. Enjoy this one! Carefully remove all green leaves attached to the stem of the cauliflower and trim any unwanted brown spots. Slice the cauliflower from the bottom into two 1-inch steaks; make sure each steak has a connection with the stem to prevent crumbling. (Reserve the remaining cauliflower for the Confit Mushroom Pilaf in the accompanying recipe.) Season lightly with olive oil, salt, and pepper. Place each steak directly on a hot grill and cook for about 7 to 8 minutes on each side, creating thatch marks. The cauliflower should be cooked through but still al dente. Lightly drizzle truffle oil equally over each cauliflower steak. Assemble the dish by placing 1 1/2 cups of the Confit Mushrooms Pilaf in the center of a plate. Place a few of the Herbed Tomatoes off to the side. 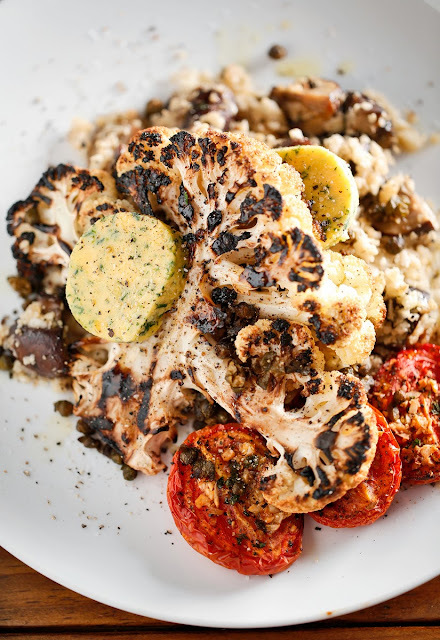 Top the pilaf with one Cauliflower Steak. Garnish the dish with a slice of Cheddar-Parsley Butter and Fried Capers. *This dish can be made vegan by omitting the Cheddar-Parsley Butter. Preheat oven to 350 degrees. Place all ingredients on a large, parchment-lined baking tray. (The mushrooms should have enough room to move around.) Cover with parchment and then with aluminum foil and bake for 30 minutes. Let it cool at room temperature. Strain and discard garlic and herbs; reserve oil and mushrooms. In the work bowl of your food processor, pulse cauliflower until it's broken down into rice-sized bits. Set aside. In a large frying pan over medium-high heat, add a tablespoon of the reserved oil and the onion. Once the onion is translucent, add the cauliflower and cook until just tender, about 5 minutes. Fold in the mushrooms. Season with salt and pepper to taste. Cover and keep warm on the stove until ready to serve. In a large bowl, combine all ingredients and mix thoroughly. Lay out tomatoes seed-side-up and roast in the oven at 350 degrees for about 20 minutes, or until the skins are lightly blistered. Set aside until ready to assemble the dish. Place the cold butter, cheddar, parsley, salt, and pepper into small bowl and knead it with your fingers until all ingredients are well incorporated. Lay out a sheet of parchment paper and lay butter in a line about 4 inches from the bottom and sides. Fold the sides of the parchment over the butter and tightly roll from the bottom creating a cylinder. Refrigerate until firm. Using a hot knife, slice the butter into ¼-inch rounds. Strain off any liquid from the capers. In a small frying pan over medium heat, heat the oil until it starts to shimmer. Add the capers and fry for 2 minutes or just until the skin starts to peel. Set aside on a a paper towel until you're ready to use them as a garnish. We love latkes! My grandmother used to make what she called "potato pancakes" for us all the time when my brothers and I were little. Hers were usually leftover mashed potatoes held together with a little egg and cooked on a griddle. 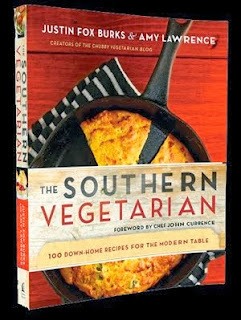 We have a version in our cookbook, The Southern Vegetarian, that we serve with beluga lentils. Here, we invite sweet potatoes to the latke party. We're serving them baked in the oven, not fried as is the tradition. We think of this as a healthier take on the classic dish, but it wouldn't be one of our recipes without just a little naughty with the nice. 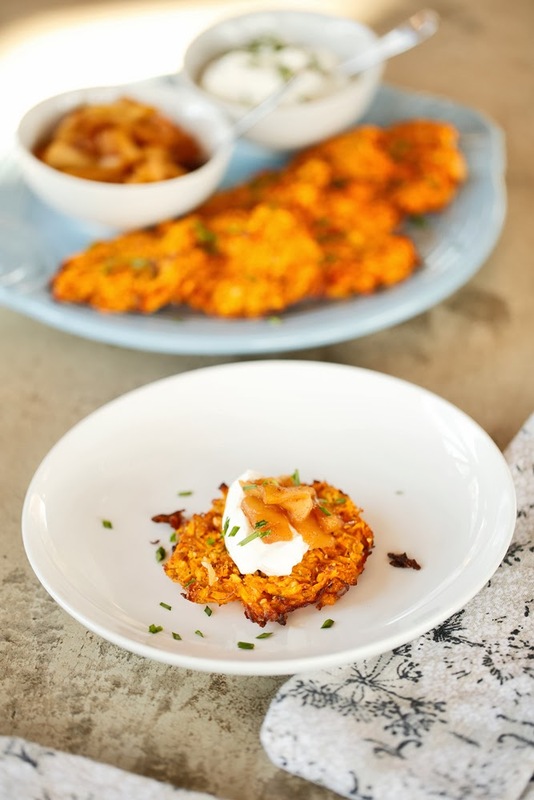 We top our latkes with a flavorful blend of apples, brown sugar, cinnamon, and brandy. It's so good you may never make them the old way again! Preheat the oven to 350 degrees. Into a large mixing bowl, place the sweet potato, apple, vinegar, canola, almond meal, onion, egg, salt, and pepper. Mix until all ingredients are well incorporated. Onto a parchment-lined baking sheet, place about 1/8 cup of the mixture and smooth it flat into a 2-inch circle. Repeat with remaining mixture. Drizzle with an additional tablespoon of oil. Bake for 12 to 15 minutes, flip, and bake an additional 12 to 15 minutes or until lightly brown and tender. In a medium saucepan, combine apples, lemon juice, brown sugar, butter, cinnamon, brandy, and salt. Place it on medium-high heat, stirring often and frequently adding a tablespoon of water when pan gets dry. This spice mixture is great on everything from sweet potatoes to pickles to BBQ Portobello Mushrooms and beyond. There are a few secrets to the deliciousness of this rub. The addition of warm spices like cinnamon and ginger add a whole other unexpected level of flavor, and the powdered porcini mushrooms give it a lot of depth. We are giving you this recipe in ratio form so you can make a little or as much of it as you'd like. If you are just making it for you and your family, use a teaspoon. If you're making it for a crowd, use a cup measurer. The great part about this is that you can be as last-minute as you want, and around here, we really love that. As long as you can get to the store before they close up shop on Christmas Eve, you can make an honest-to-goodness, from-the-heart, handmade gift that will improve the lives of the ones you love. So, put your feet up and ignore all the 'last-minute shopping!!!!!' marketing tactics we're currently getting bombarded with this weekend…you still have plenty of time to make something cool instead. like based on this ratio. *Dried porcini mushrooms can be found at almost any specialty grocery -- including in the bulk bin at Whole Foods. Turn the dried mushrooms into a powder by placing them in a coffee grinder or food processor and pulsing until no large bits are left. Books at Today's Winter Market in Downtown Memphis from 10-2:00! Come to the MFM Winter Market today and pick up some books for the folks on your list this holiday season! We'll have The Southern Vegetarian, Simply Grilling, and Sewing School 2 for you. See you between 10 and 2! Purists, beware: this will not please you in the least. For one, it's not chicken, so there's that. 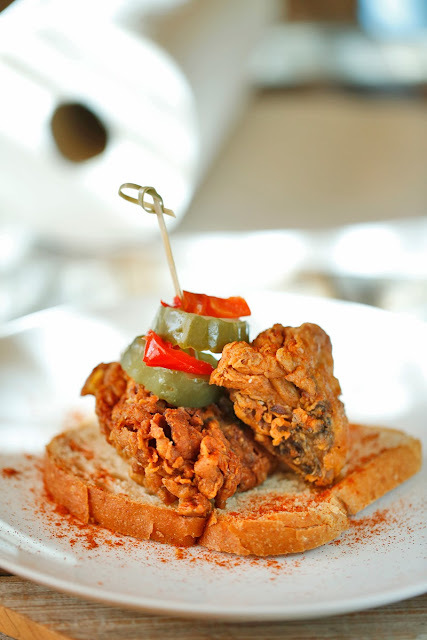 For two, while we took inspiration from your Prince's, we do not intend for this to be a replication, just a vegetarian tribute to the real Nashville hot chicken. That said, this is pretty awesome! I had these hen of the woods mushrooms sitting in my fridge just asking me what I was going to do with them. We love taking inspiration from the common name of mushrooms as they offer some insight into the flavor and texture of the fungi. (See also Oyster Mushrooms Rockefeller.) So the 'hen' part of hen of the woods made me think of chicken, which made me think of Prince's Hot Chicken in Nashville. I couldn't shake the idea even though frying isn't typically in our repertoire. The texture of the mushrooms is perfect for this. The spice, while not overwhelming, is still really hot. 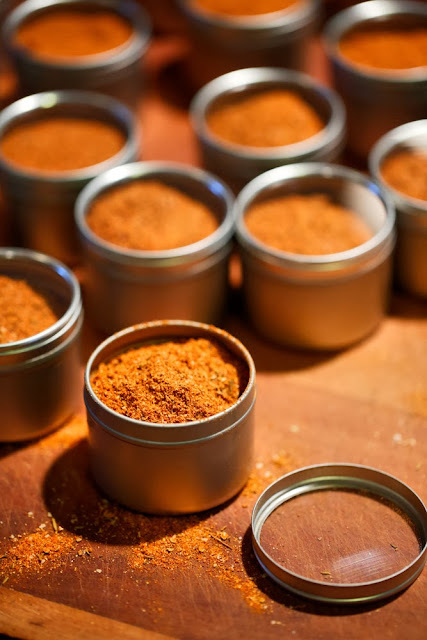 You can add more or less cayenne as your taste may dictate. 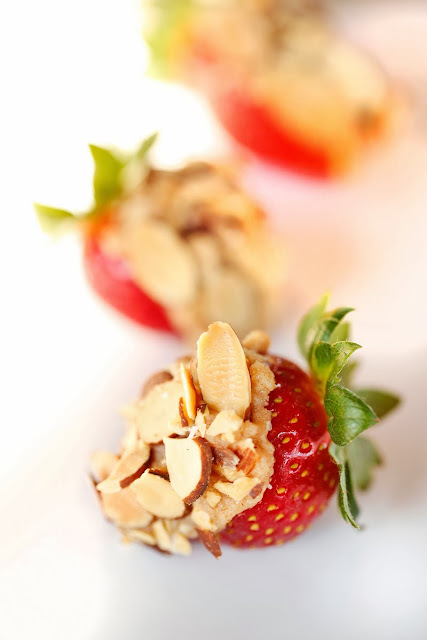 Make this for yourself as a treat sometime. You'll be glad you did. In a 4-quart saucepan over medium heat, add enough oil to fill halfway. You want the oil temperature to be 350 degrees. Prepare the rest of the ingredients while the oil heats up. In a small bowl, mix together the paprika, cayenne, pepper, salt, garlic, and sugar and set aside. In a large bowl, whisk together the yogurt, milk, egg, and half of the spice mixture. Carefully toss the mushrooms in the yogurt and egg mixture and allow them to rest in the fridge for 10 to 15 minutes. Using a food thermometer, check to make sure your oil is at 350. Add the remainder of the spices to a large food storage bag along with the flour. Shake to incorporate. Remove the mushrooms from the yogurt and egg mixture and add them to the bag. Carefully move the mushrooms around to coat with the flour mixture. 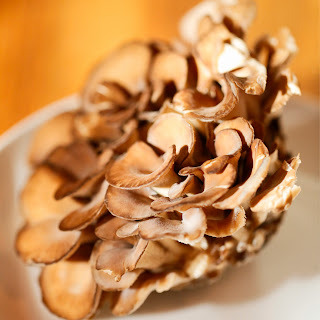 *Also known as maitake mushrooms. Available at Whole Foods and Asian grocery stores. This salad is super simple and really delicious, a combination that works right well for us these days. We've been so busy -- like, a no-time-left-for-TMZ, must-schedule-a-full-hour-for-folding-insane-piles-of-laundry, going-to-the-dentist-is-actually-so-relaxing level of busy, you know the drill…but we never want to skimp on mealtime, so we make adjustments. We have stuff to do, but we always have to cook! In a large non-reactive glass or plastic bowl, massage the kale with the lemon juice; tear the leaves with your hands until it's in bite-sized pieces. In a small bowl, whisk together the mustard, mayonnaise, garlic, worcestershire, and honey. 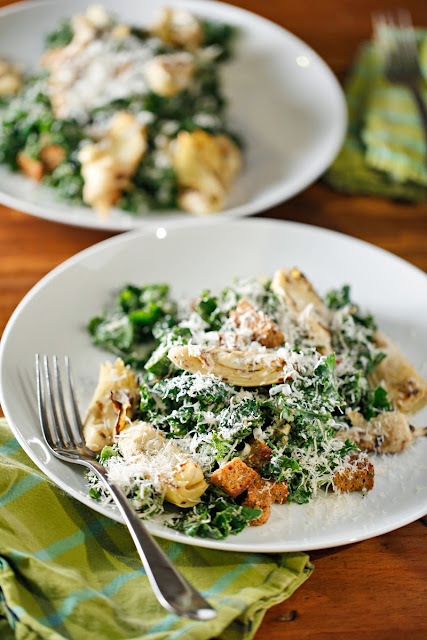 Add this and half of the parmesan cheese to the kale and toss to incorporate. Allow it to sit covered in the fridge for a couple of hours -- the acid in the lemon will soften the kale. Add salt and pepper to taste once you are ready to serve. Place mixture into a large bowl or divide onto 4 plates. *Make your own croutons by drizzling the bread of your choice with 1 tablespoon of olive oil and placing it into a 250-degree oven until dry and crisp. A French of Italian loaf works well for this, but you can also use a gluten-free bread like we did here. Add extra flavor if you'd like by adding in an Italian herb mix or garlic powder to the bread before toasting. First off, we have to tell you that our lunch at The James Beard House as a part of their "Enlightened Eaters" series could not have gone any better than it did. Wish we had something more disastrously interesting and dramatic to report, but alas…we do not. We were thrilled with everything about our day including the wonderful Beard House staff, the three-course 'snack' we presented, the way we got our message about modern Southern cooking across, the attentiveness of our friends (new and old) who came to see us, and the reception we received from all. This fall, as we discussed the set-up of the event, it was requested that we provide a snack. "A snack…" we thought. How would we get our vision across? We're pretty serious about how we present our food and what we choose to cook for any occasion, and we always aim to make something creative and memorable. We devised a plan: we would create a three-course meal in three bites. The theme would be 'Smoke' since the Memphis air is always permeated with the aroma of hickory. Our menu came together quickly. The first bite was our Smoked Stuffed Date with Goat Cheese and Pecans. The second bite was Artichoke Hearts and Succotash over Smoked Cheddar Grits, our version of shrimp and grits. Dessert was Chipotle Chocolate Pudding with Sorghum Granola and Honey Cashew Cream. Each of these dishes came straight from The Southern Vegetarian Cookbook: 100 Down-Home Recipes for the Modern Table. The food was well received. People asked really thoughtful questions. It was such an honor to share our food and our ideas with this wonderful audience in such a beautiful, hallowed space. Cooking at the James Beard House was such a thrill. Honestly, we don't think anything else could top it. We shared the kitchen with the talented guys from Charleston's 82 Queen; they were serving dinner that night at the Beard House. They were cool and worked with us while graciously sharing the kitchen space. (We knew that we would get along once we heard that they were from the South, too!) Amy plated the first and third courses while I worked on the components for the second course. I so hope there is a photo of me in a jacket and tie pan-frying artichoke hearts that day. Our guests came in throughout the kitchen as we finished up our last dish. We were a little stressed, super-focused, but very grateful that people were coming to see us. We placed the last garnish just as the clock struck noon, the start time for our event. We stepped outside to catch our breath. 5-4-3-2…1! Kris gave us an amazing introduction that I will always remember. We talked to our audience about who we are, where we came from, and how we got involved in the world of food as a photographer and a writer. We explained that we had never been to culinary school, but we had been in the kitchens of some very talented chefs. That's where we really learned how to cook, how to plate, and how to focus our flavors. "It's an honor for a chef to be invited to The James Beard House," I said, "You can only imagine how it feels for us as home cooks!" Much of our talk focused on our journey from an overweight, sedentary couple to our current understanding of what it takes to be healthy, including moderation when it comes to bread and cheese and sugar, and, of course, actual exercise. For those of you who don't know, I have lost 75 pounds and have gone from a couch potato to a marathoner and triathlete, and Amy has lost 30 pounds with a combination of yoga, dance, change of diet, and running. A slideshow of images from our blog and cookbook ran on a constant loop as we talked and laughed with those who come to see us. As the last part of the experience, we had a book signing. It was wonderful to meet Susan Ungaro, the director of The Beard Foundation, and to chat with all of those who showed up to see us and hear what we had to say. Once that was over, we high-fived one another, hightailed it back to The Jade Hotel, and crashed for a few hours. We were exhausted, we were elated, and our adrenaline had finally evaporated. We wouldn't trade this experience for anything in the world. The best part is…we were invited back to talk about our upcoming second cookbook. *Next week, be sure stop by the very festive MFM winter market in downtown Memphis on Saturday, Dec. 14 -- we'll be there with copies of The Southern Vegetarian cookbook and would love to sign a book or two for you. Of course we think it makes a great gift! You can't get any more clichéd than tofu and granola when it comes to vegetarian food, so here's to making what's expected into something that's absolutely delicious. We are reclaiming these items from the fringe! This is a variation of our Sea Salt Granola, the one we put on roasted beet salads and use to top Greek yogurt. 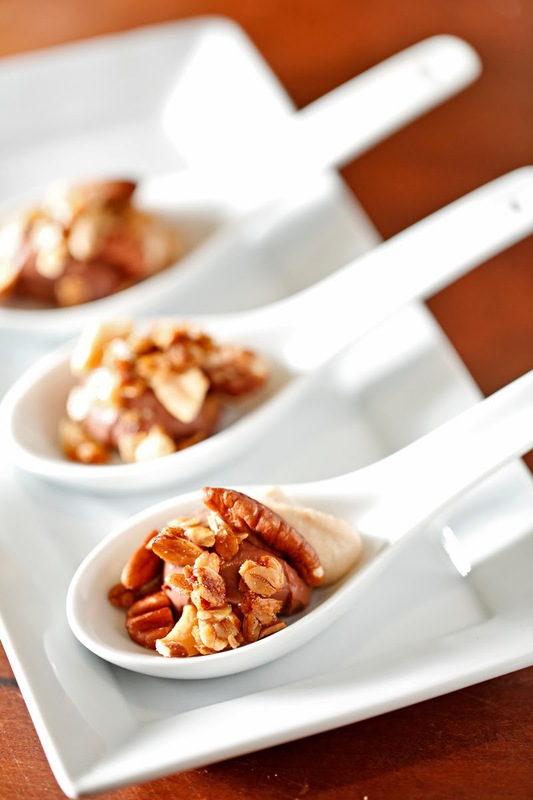 It was one of the components of the chipotle chocolate tofu pudding and cashew cream dessert we created for our Enlightened Eaters Series talk at the James Beard House this week. We wanted to use some favorite recipes from our Southern Vegetarian cookbook and also highlight Southern ingredients in each of the three dishes we made. Here's what we used overall: Delta Grind grits, Steve's beans, peas, okra from Concord Farm plus our hickory smoked hot sauce from the farm's cowhorn and jalapeño peppers, Olive & Sinclair chocolate, Georgia pecans, Martin's Sorghum, Robert Hodum's honey, and Zatarain's Creole Mustard. We're working on a recap so that you can see how it all went and celebrate with us! *Here's an easy upgrade for chocolate granola, another great gift: just add 1/2 cup dark chocolate chips to the warm granola after it's out of the oven and stir to coat it all before cooling it in the fridge. Jar, ribbon, done. So much time is spent in the kitchen over the Thanksgiving holiday that when it's all over, we tend to stay away from the stove, and pots, and pans, and all of the piled-up dishes. But you can't go out to eat for every meal, so this time of the year in between holidays calls for a few warm, comforting, and most of all, simple dishes that can be heated and assembled in no time at all. This spicy, three-ingredient soup is just the thing. good-quality stuff. Store-bought kimchi, like Sunja's, works great here, but if you're not totally tired of cooking, try tackling the task of making your own. Same goes for the vegetable stock, use a good store-bought kind or make your own and infuse it with any flavor that you'd like. *If you're buying kimchi at the store, read the labels and seek out the vegetarian kind. Some more traditional recipes contain fish, fish sauce, or even oysters. So if you don't want any fermented oysters, look for the veg version -- Whole Foods usually has it. 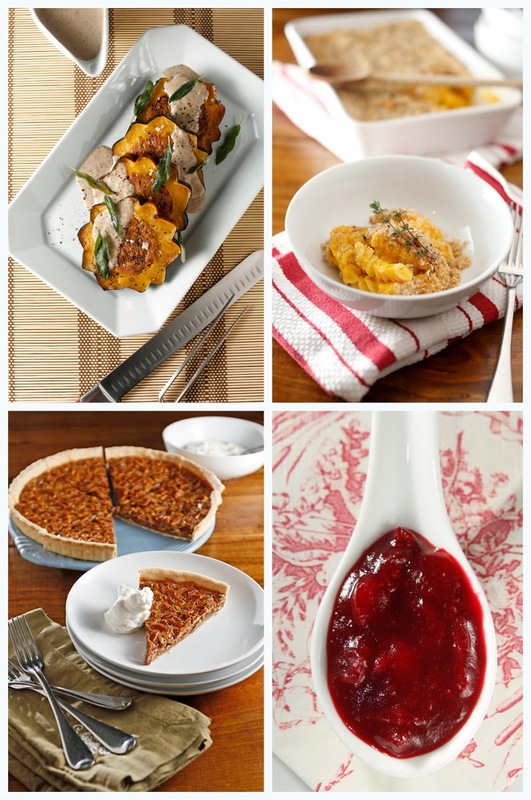 We're thinking about what we need to make for Thanksgiving dinner at our house -- whatever else would we be thinking about this week, come on now! -- and these are our go-to TCV recipes for the big day. We're taking care of the gravy, the greens, the rolls, the cranberry sauce, the stuffed acorn squash, and the pumpkin pie; the family's got everything else covered. The best thing about this time of year is time spent with your people. We're excited to have a couple of other family meals to attend and another Thanksgiving meal with our friends. 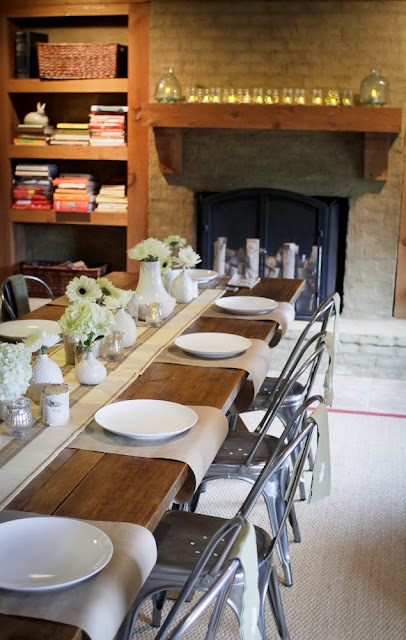 It's a whirlwind 48 hours, but how better to spend it than in the kitchen and at the table, don't you agree? So enjoy your traditions this week and be generous with your good graces. It's sometimes easy to get stressed this time of year, but if you focus on making great food with the folks you love, and you don't worry too much about it all being so perfect, you know you're going to have some amazing moments to remember for a long time to come. The food part is pretty fun, but we all know the other stuff is really what it's all about. I love kimchi! I make my own and I still have to buy it when I run out. It makes the perfect snack right out of the jar, and it renders even the most bland dishes irresistible if they're topped with this spicy, fermented magic. 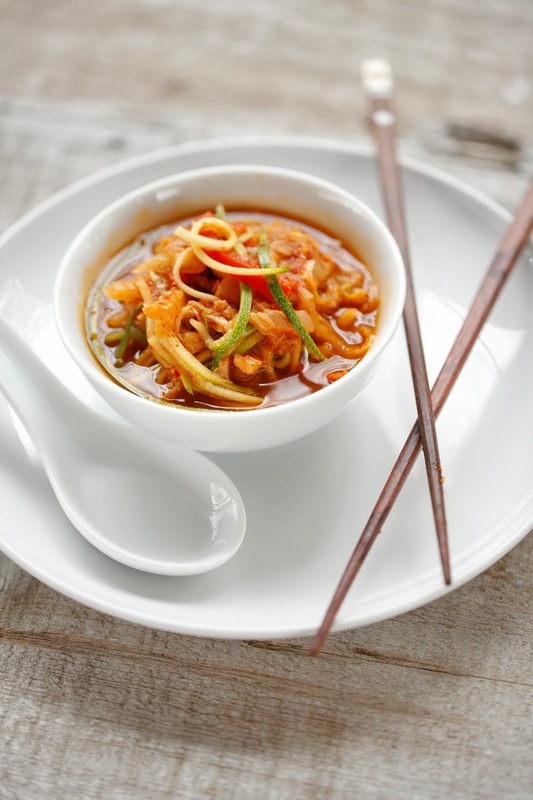 If you're buying kimchi at the store, look for the vegetarian kind. Some more traditional recipes contain fish, fish sauce, or even oysters. So if you don't want any fermented oysters, look for the vegetarian kind. Whole Foods usually has it. They stock Sunja's brand, which is great. 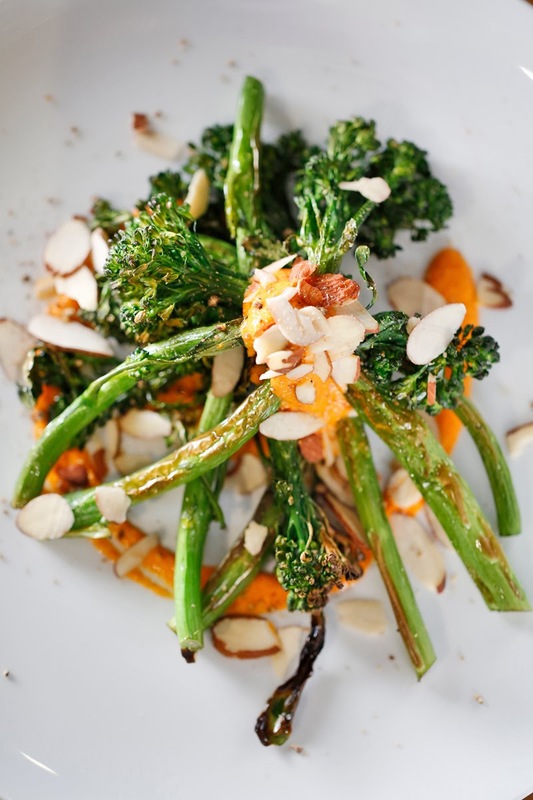 Here we've taken broccolini and lightly charred it under the broiler to bring out the nutty, meaty flavor. 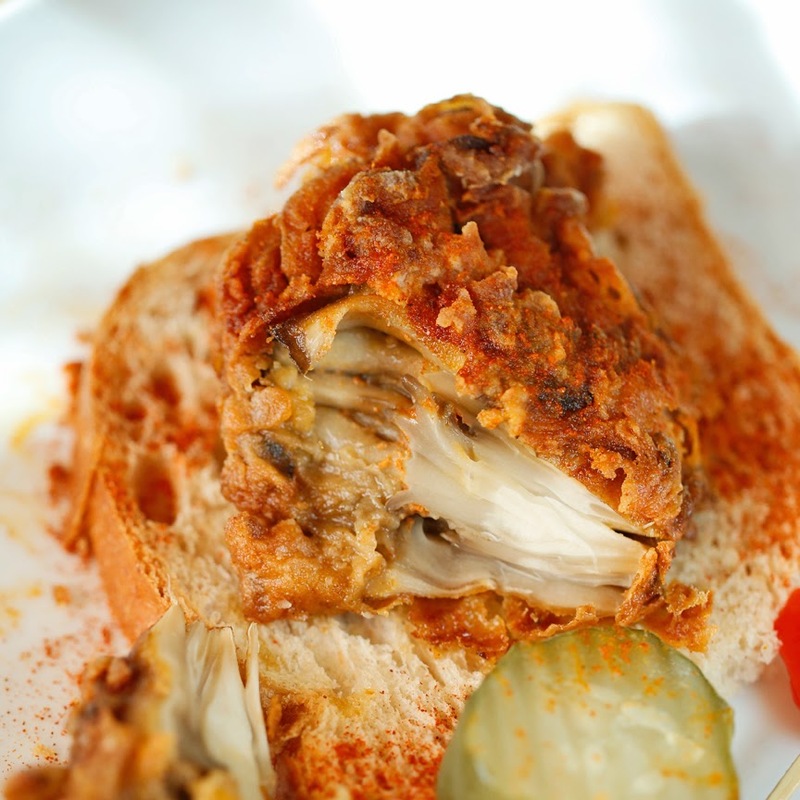 We topped it with an amazing sauce made with just two ingredients: kimchi and mayo. Don't be fooled by the simplicity -- it packs a powerful punch! This dish is fun to eat with your hands. Just pick the broccolini up by the stem, swirl it around in the sauce, and chomp. It's maybe like some healthier kimchi fries? You'll love eating your vegetables when they taste this good! Into your immersion blender cup, place the kimchi and the mayonnaise. Blend until smooth. You may also use your regular blender or food processor. Set sauce aside until ready to plate. Place broccolini in a covered, microwave-safe dish and microwave on high for 2 minutes. Allow it to sit, covered, for another 2 minutes so that the steam tenderizes it. Uncover and toss it with the sesame oil. Oh, this wonderfully simple, meaty taco filling made with spiced eggplant and mushrooms…sure, it's similar to our Mushroom Meat, but since it's cooked on the griddle and spiked with cumin and ancho chili, it's the perfect thing to fold into tacos, burritos, tamales and enchiladas -- just like you would do with ground beef. 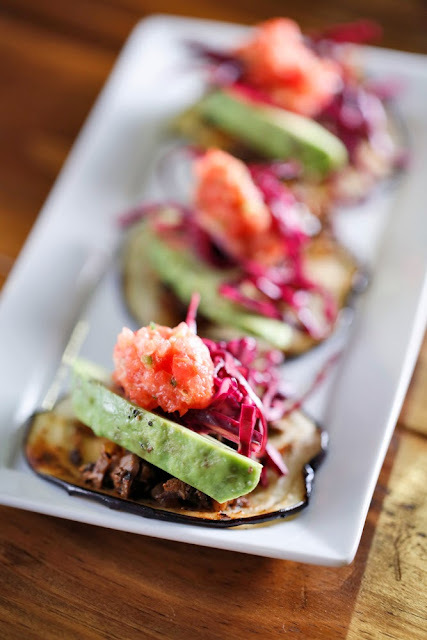 The dish has a tremendous amount of flavor, and the texture of the creamy avocado complements the crunchy slaw. I would totally make this as a party appetizer or for a casual dinner with friends. 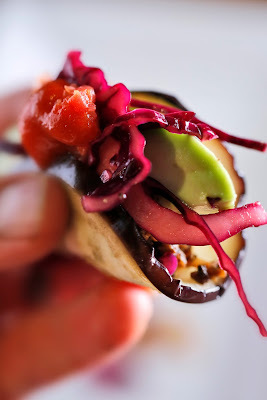 Make the Red Cabbage Slaw and Simple Salsa according to the recipe and set aside. Slice off the vine end and the bottom of the eggplant. Starting at the widest part of the vegetable, cut 15 1/8-inch rounds. These will be your tortillas. Roughly chop the remaining eggplant and add it to the work bowl of your food processor. Pulse in the food processor until the pieces are about the size of a black-eyed pea. Place chopped eggplant into a large bowl. Continue to chop the mushrooms and onions in the same way and combine with the eggplant, ancho chili, garlic, cumin, salt, pepper, olive oil, sesame oil, and sherry vinegar. Place your long griddle pan, the one you usually make pancakes on, over high heat. Sear the eggplant rounds for a few seconds on both sides until warmed trough and lightly brown. Set aside until ready to use. Dump the eggplant and mushroom mixture onto the hot griddle and spread it evenly. This step is key in order to get the right texture of the dish. If you don't have a griddle pan, cook the mixture in batches in a large frying pan. Keep the mixture moving around the griddle until it appears dry and the onions have started to become translucent. Set aside until you are ready to assemble the tacos. To build an Eggplant and Mushroom Mini Taco, place 1 eggplant round on a plate, top with 2 tablespoons of the eggplant and mushroom filling, 1 slice of avocado, a little of the Red Cabbage Slaw, and a spoonful of Simple Salsa. Really, 3 to 4 tacos makes a whole serving, especially with a side of beans and rice, so this will serve 4. We did a little informal focus group on our Facebook page about the types of recipes y'all would like to see included in our (!) next book. We heard you loud and clear. Luckily, what you want is pretty much exactly how we're cooking now. 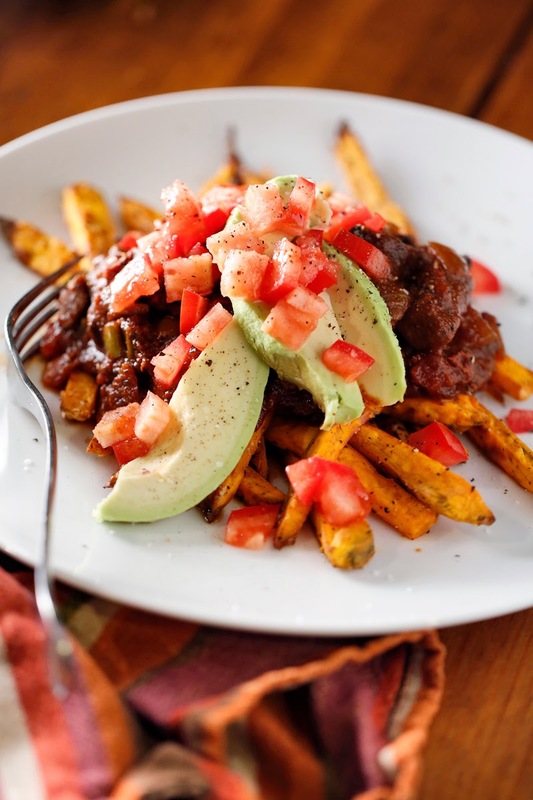 Among the repeated themes were the call for simple, creative meals made from whole foods. Many of you wanted more dairy-free recipes that are still hearty and delicious. This soup is one of those things that we'd just whip up and never put out there because it seems simple, but I think there are some solid ideas here that are worth talking about. This is a great, simple tomato soup recipe made with fresh carrots, onions, and celery. The creaminess of the soup comes from cashews, not dairy. It's delicious and wholesome, and it packs a good bit of protein. So, enjoy -- and keep an eye out for new, creative, and healthy recipes from The Chubby Vegetarian! In a large soup pot or dutch oven over medium-hight heat, add the olive oil and the onion, carrot, celery, and garlic. Cook, stirring often until vegetables have softened and are staring to brown, about 8 minutes. Add the corriander and crushed red pepper and cook for another minute. Add the tomatoes, broth, and cashews. Reduce to a simmer, cover and cook for 10 to 15 minutes or until vegetables are soft. Using an immersion blender, blend soup until smooth; this may take a few minutes. 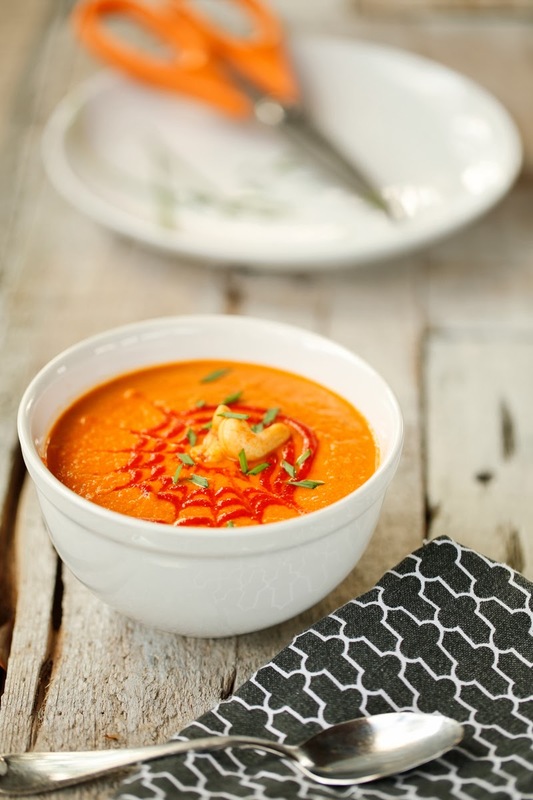 Alternately, use a food processor, but be careful --blending hot soup can be dangerous. I've had 3 or 4 of these Lion's Mane mushrooms make their way through my kitchen, and they've all been unique and delicious. It did take me a few tries to figure out the perfect way to use them. I believe the best preparation of these strangely beautiful, snowball-looking mushrooms is to roast them on a cedar plank or in a hot oven with a little olive oil or butter. After that, all you need to do is slice it and spoon a mignonette sauce over the top of the whole thing. Raw, the Lion's Mane tends to soak up anything you put on it like a sponge, so I wanted to cook the mushroom before adding any additional flavors. The mignonette, a sauce that's traditionally used on raw oysters, is the perfect thing to bring it all together. 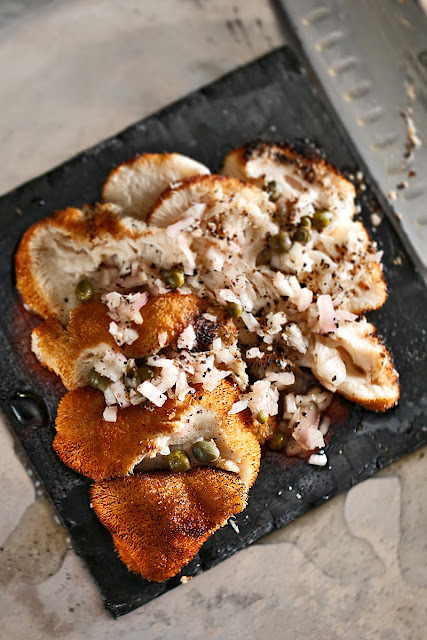 The brightness of the vinegar and the sweetness of the honey add balance, the shallot adds a bit of freshness, and the capers give it a salty bite that's just right. Preheat your outdoor grill to medium. Place the cedar plank on the grill until it starts to smoke. Drizzle mushroom with the olive oil. Flip the plank over and place the whole mushroom onto the warm side of the plank. Close the lid and cook for 10 to 15 minutes or until the mushroom is warmed through and the frilly part is starting to brown. While the mushroom is cooking, assemble the mignonette in a small bowl by mixing the vinegar, shallot, honey, and capers. I spent much of last summer questioning my sister-in-law and brother-in-law about the Paleo diet. I couldn't understand why they would go from being vegetarians to being cave people. It didn't make any sense to me…until a few weeks ago. I had put on a few pounds and was looking for a way to get my weight back on track. I decided to give the old Paleo diet a try. How can a vegetarian stick to a diet that is largely based on consuming unusually high amounts of protein -- especially given that both beans and rice and all dairy are off the menu? The short answer is eggs. I ate many, many eggs. I also ate handfuls of almonds, cashews, and sunflower seeds as a pure protein source. It seems limiting in a way, but I love to cook with parameters, especially when things like eggs, avocados, sweet potatoes, and mushrooms are all in the green zone. They are some of my favorite foods anyway! I ate roasted eggplants with Romesco, cauliflower with puttanesca, eggs poached in salsa, curried butternut squash soup, egg foo young, and this wonderful bean-free vegetarian chili. The result? I lost the extra pounds in the space of 2 weeks. Not bad, not bad at all. So, while I'm not giving up pizza and biscuits and cupcakes, I will likely enjoy them in more limited quantities now. Moderation: nice to see you again. In a large soup pot or dutch oven over medium heat, melt the coconut oil and add the onion. Take your time with this step. You want to cook the onion for 15 minutes or so stirring occasionally until they are nice and brown. This is where much of the flavor comes from. Add the ancho, paprika, garlic, salt, pepper, and cumin and cook for another 5 minutes or until a nice fond, the brown layer stuck to the bottom of the pot, has formed. Add in the peppers, portobellos, tomatoes, crumbled porcini, broth, and vinegar. Using a wooden spoon, scrape up the fond from the bottom of the pot and stir it in. Bring pot to a low boil and then reduce to the lowest heat. Cover and cook for one hour. We tried some Justin's Vanilla Almond Butter in Boulder, Colorado (where the company is based) last summer and got hooked. You can't get this flavor in Memphis yet, but Whole Foods Poplar here in town recently snagged us a bunch of so we could try it again and make something fun with it. 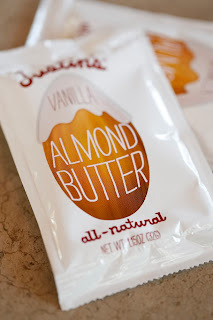 The result: almond butter frosting! It was great on top of the chocolate cupcakes we brought to a recent birthday party at the legendary Pete & Sams. After we floated a question about what the heck else to do with the leftover frosting, Mel S. advised us to try it with strawberries -- a capital idea. Better than cupcakes, maybe. It's kind of like a really fresh PB&J, and even though it's so out of season, oh, well -- it's still so much fun.